Needing electric scooter insurance, or insurance for an electric scooter or electric moped in the UK? The key benefits of electric motor scooters are that they are cheap to buy and cheap to run. As you may be aware, here at pluginsure we have our own electric car insurance scheme and are currently working on a similar offer scheme assist you in finding cheap electric scooter insurance. 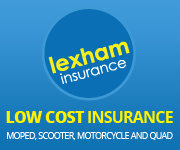 However, whilst this remains under development, you can seek a quote for your electric bike, electric moped or electric scooter insurance quote by clicking on the following link which will take you to the website of motorcycle insurance specialists Lexham Insurance. There are a wide range of electric scooters on the market such as the Xero, Zippe, Vectrix, e-max, Zepii or a Yogo electric scooter or moped. Whatever the voltage, whatever the wattage – pluginsure endeavours to keep updated with all new electric scooters. Although the team at pluginsure are currently unable to provide you with a quote for your electric scooter, we'll do our best to put you in touch with somebody who can with a view to assisting you in finding you insurance for all types of electric motor cycles. In the meantime we'll continue working to bring you our own product providing cheap insurance for the latest electric, battery powered scooters and electric mopeds in the UK. You might find that your current insurance company can’t or won’t provide you with an electric moped or scooter insurance quote. They might not even have heard of electric motorbikes and certainly will not specialise in electric scooter insurance. We are aiming to change that and if it’s insurance for an electric motorcycle to use on your daily city commute or a rural ‘runabout’ that you’re after, we will do our utmost to help.